Nothing is lovelier than a sparkling fire in the living room of 221 B Baker Street, while busy people go after their tasks on the streets. Hearing some footsteps, Sherlock Holmes and John Watson already know that a new client arrives. Several Conan Doyle stories begin with this idyllic picture, but it was a favourite starting point for other authors as well, and illustrators also liked the topic. Throughout history, fireplaces witnessed murders, caused accidents, helped to destroy evidence, inspired wise thoughts and of course warmed up shuddering people. 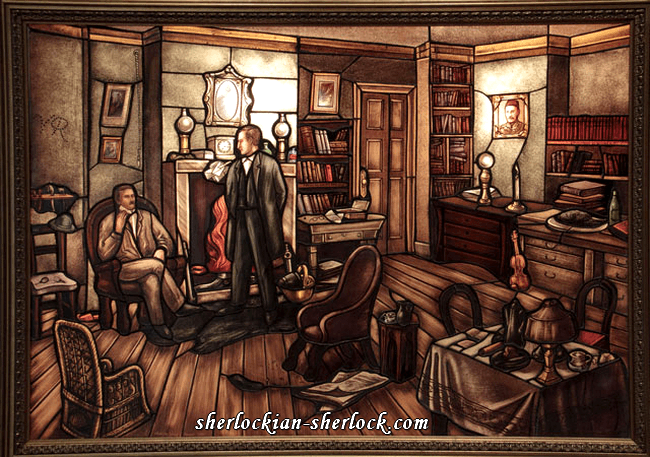 The fireplace at Baker Street is a real symbol of the world’s most famous detective, and he came into contact with other hearths as well during his investigations. In museums, pubs, hotels and replica rooms dedicated to the great detective there is always a fireplace. In The Sherlock Holmes Museum in London there is a desk in front of the hearth and a pipe and a magnifying glass lies on it. An actor impersonating dr. Watson greets the visitors and he often chats with them there. Fire is a natural phenomenon that contributed to the survival and development of humankind. We can warm up by it, we can use it to dry our clothes, it is useful to make tools, for cooking, it helps ignite or melt different materials and is even used to cremate corpses. Lots of people gain fertile lands by burning forests. Fire is an important symbol in many religions. In ancient Rome the Vestal Virgins learned for ten years how to cultivate the sacred fire. After a decade of studying they became servants for ten years, and after that they had the right to teach others. In Catholic religion fire organically belongs to Purgatory and Hell. It is a historical fact that Stanislaus I of Poland died in his castle in Lunéville, France because the flames of his bedroom’s fireplace caught into his robe (the king died a few days later – his injuries were fatal). Before the discovery of the chemical elements humans thought the world was built up by the four basic elements: earth, water, air and fire. No wonder that there are stories about fire in Greek mythology too. Zeus ordered the two titans, Prometheus and his brother Epimetheus to bring into life creatures that will populate the earth. Epimetheus created animals, while Prometheus made people, using the gods as an example. Creation took Prometheus too long, so his brother gave all favourable characteristics to the animals. This way people remained defenceless, and out of pity Prometheus stole the fire from the Olympus. Later Zeus chained him to a rock and an eagle called Ethon came and tore his liver every day. The angry king of the gods punished humans with many bad things, set free from a box by Pandora, the first woman. According to the myth weariness, illnesses and old age belonged to the bad things, among many others. Sherlock Holmes is very human because he works hard for a living, there are times when he is ill and he also grows old. But there was one single good thing in the box of Pandora: it was hope. According to the myth thanks to hope people do not give up while facing tragedies. Sherlock Holmes is steadfast as well, and he is the symbol of hope (Recommended article: I believe in Sherlock Holmes). The fireplace gives warmth and makes us feel at home. We can even read by its light. Holmes keeps his books in a safe distance to it. Sitting by the fireplace he can read, think and contemplate (More information: The importance of reading). A fireplace is also ecellent for aromatherapy – we just have to throw some aromatic leaves or other parts to the fire, for example fir. The crackling of the logs is relaxing, just like to observe the dancing of the flames. No doubt that the hearth is a kind of shelter for the great detective, the place of leisure. He can play the violin before it (More information: The violin of Sherlock Holmes), he can sit beside it for a chat with Watson, and he can even welcome his clients there. He can keep his unopened letters on the mantelpiece just like his Persian slipper containing tobacco (Link: The pipes of Sherlock Holmes), but a watch, a mirror, a skull or some other useful things can be placed there. Holmes furnishes it so practically just like his desk or other parts of his Baker Street home. At the same time it is the symbol of taking responsibility and masculinity. Operating a hearth is a huge responsibility – you have to have wood, to pay attention to the flames, and sometimes the chimney must be checked by a sweep. 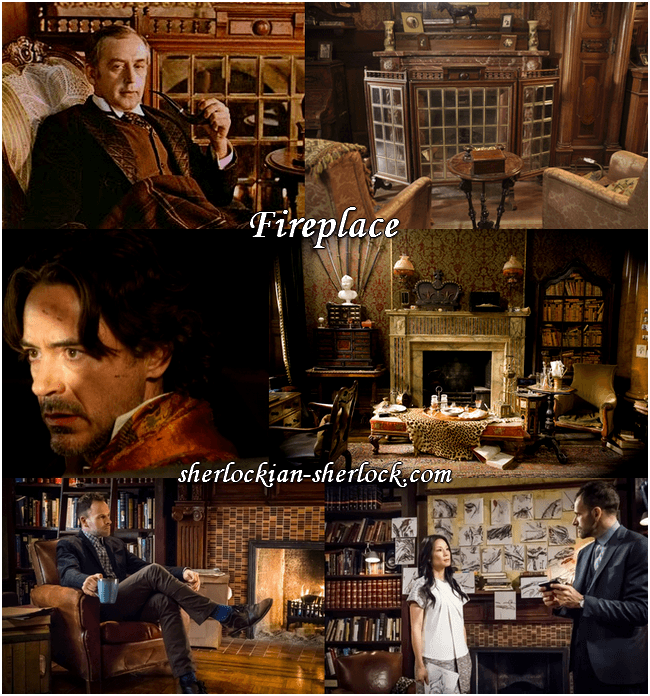 We know that there is a bearskin rug in front of the fireplace, between the chairs of Holmes and Watson. Conan Doyle does not say anything of its origin, maybe they inherited it or it was a present. There were no bears in England, but the country had several colonies and flourishing commerce, so it was not too difficult to get a bearskin (The peculiar cap of the British Foot Guards is also made of this material.). Because of the dark colour of the rug dirt is not too visible on it, it is not too heavy and it is pleasant to step on it. The fireplace and the bearskin rug together may symbolize that man surmounted natural phenomena and the world of animals. He is the master of the destructive forces, but he also destroyes them. The fireplace can be the scene of violent things. In the adventure of The Abbey Grange an impetuous quarrel takes place in front of it, which is ended by a deadly knock of a poker. In The Speckled Band dr. Grimesby Roylott demonstrates his power with bending the poker at Baker Street – and then he hurles it into the fireplace and leaves without saying goodbye. He hopes that the detective will be afraid of him and drops the case. But Holmes does not get scared so easily. He laughs and shows Watson that though he is not as muscular as their visitor, he can straighten the poker. 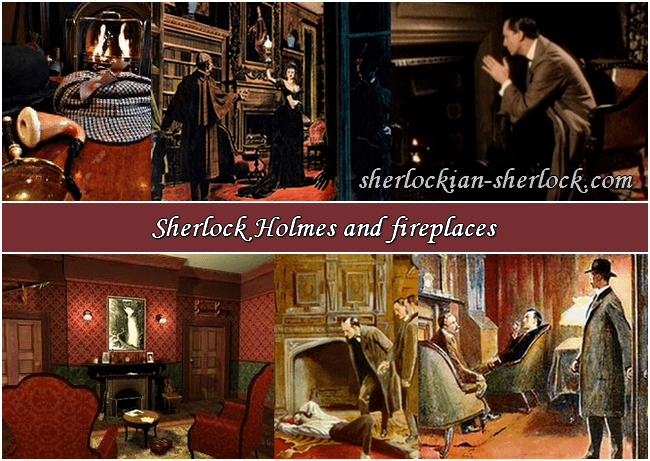 There are countless film adaptations of the adventures of the detective genius, and the fireplace as the symbol of Sherlock had been mostly treated with respect. Vasily Livanov’s Holmes had a beautiful glass fireguard before his fireplace. In Murder by Decree the sleuth (Christopher Plummer) sneaks into a crime scene through the chimney, disguised as a chimney-sweeper. On the fireplace of Robert Downey Jr. there is an ornament which depicts the British crown. In CBS’s Elementary Sherlock and Watson (Jonny Lee Miller and Lucy Liu) often pin important papers at the mantelpiece. 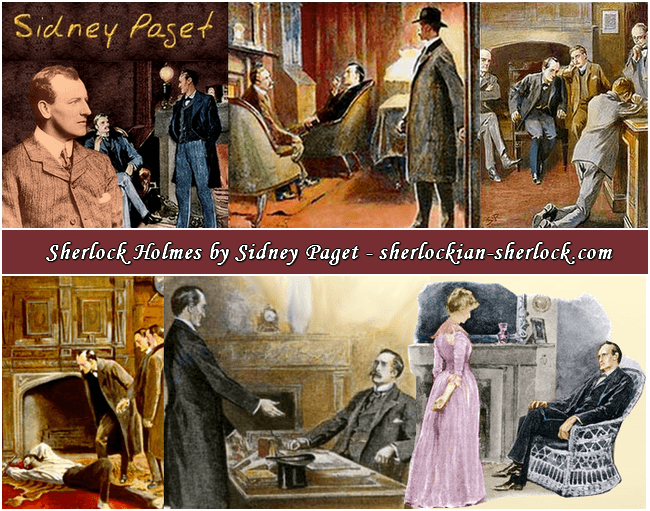 There was sometimes a pipe-rack on the mantelpiece of Jeremy Brett’s detective, and above it hung Sidney Paget’s black-and-white drawing of Reichenbach Falls. In BBC’s Sherlock, however, this Holmes-related symbol is dishonoured when Charles Augustus Magnussen pees in it (Earlier in the series Sherlock beats the deerstalker, then he starts to wear it when John tells him that the hat makes him famous. Benedict Cumberbatch’s drunk Holmes also clowned around with the magnifying glass – and these symbols should be treated with greater respect by creators who claim that they are fans of the Canon. Some may say the whole situation is not so serious at all - but we must not forget that respect begins with noticing minor things and we learn to appreciate them.). It is much better for everyone to think of pictures and other artworks by artists like Conan Doyle, Sidney Paget and Robert Fawcett. Our site is especially honoured, because world famous glass artist Joseph Aigner gave permission to show his beautiful Sherlock Holmes artworks. We usually try to end our articles with drawing a lesson, but now we let the picture, the idyllic Baker Street scene speak up for itself. On numerous paintings, photographs, in poems and tales the fireplace is also the symbol of Christmas and love – and we love Sherlock Holmes, his home, his creator and all who treated him with respect.